There are events throughout history that leave yourself scratching your head in disbelief. The 51st Super Bowl was without question one of those moments. I’ve seen my fair share of Super Bowls and I thought I’d seen it all in 2015 when the Seahawks blew a 10 point lead and were 1 yard from glory when they inexplicably chose to throw the ball instead of running which led to an interception. But that pales in comparison to what unfolded last night. 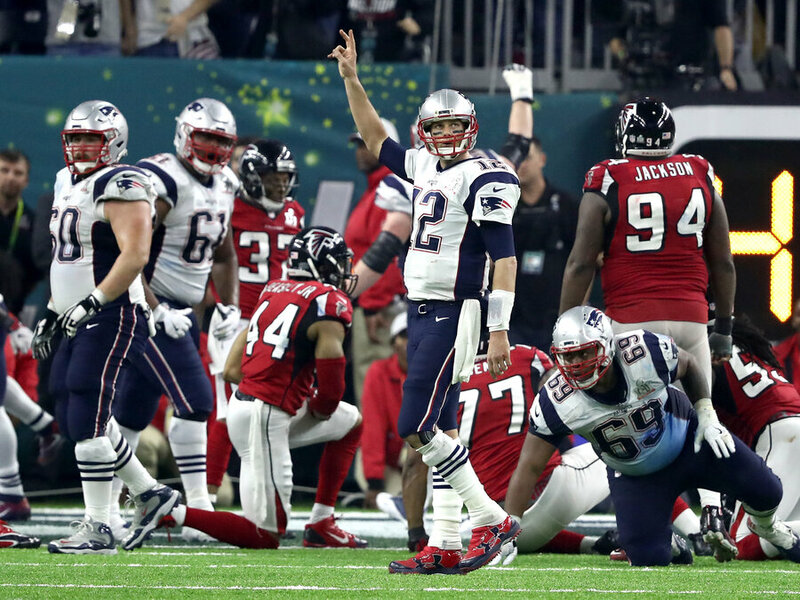 When the Atlanta Falcons accumulated a 28-3 lead at the beginning of the 3rd quarter there was talk of humiliation, this lead was seemingly insurmountable, a comeback so statistically improbable that not even the most ardent Patriots fans could have envisaged it, some even had the audacity to suggest Patriots quarterback, Tom Brady should retire. Little did they know what was to come and how instrumental a role Brady would play in it. Even by the end of the 3rd quarter the Falcons had a healthy 19 point lead. The Patriots would have to score a field goal and two unanswered touchdowns with two point conversions under severe pressure, a tall order under normal circumstances. Many in Europe had turned off and went to bed thinking the game was long over. But when the Falcons fumbled the ball in their own half, the momentum and the game turned. Even after securing the 8 point touchdown the odds were still stacked against the Pats. The Falcons were agonisingly close to getting a field goal which would have ended hopes of a comeback but their quarterback was sacked which put them out of field goal range and they had to punt. Suddenly the Patriots sensed a history-making comeback and seised it in the most spectacular way possible. When Julian Edelman caught the most improbable of catches you knew this was going to be their day. Brady then did what Brady does, in the dying embers of the game, threw the touchdown that with the 2 point conversion tied the match. For the first time in Super Bowl history, overtime would be required. The rules of overtime mean that the first team to score a touchdown wins the game, with a field goal giving the opposing team an opportunity to respond. The coin toss couldn’t be more important under these circumstances and of course it went to the Patriots. And it only took them a matter of minutes to score the decisive touchdown which etched their names in sporting history. To put this feat in perspective, no team has ever come back from more than 10 points down in a Super Bowl. To complete a comeback like that in a normal game would have impressive, to do it in a Super Bowl when the eyes of the world are watching is just unfathomable. For Edelman to make that catch under those circumstances just defies reason and to break so many records under the highest pressure imaginable just reinforces what a great team the Patriots are. If there was any doubt before last night on whether Tom Brady was the greatest of all time, he dispelled it with the performance of his life, directing his team to the greatest comeback in Super Bowl history. What makes it all the more impressive is how poorly he started by Brady standards. He was sacked multiple times and threw an interception which led to a touchdown. To respond in the fashion he did epitomises mental strength and only confirmed what a great champion he is. Anyone watching last night should feel privileged to have witnessed the greatness on display. I was rooting for the Falcons, and can only imagine the despondency their team is feeling today but last night is why we watch sport. To experience emotion, drama and passion. Props must go to Lady Gaga too for her impressive half-time performance. She delivered on the biggest of stages and her little monsters will be incredibly proud. The only disappointment was the lack of a satanic ritual but we can’t have everything.